Fort and Winfree devote an entire chapter of their book to chipping away at this statement from a variety of angles. Poring through data in various NCAA reports, they conclude that this perception stems largely from an oversimplification of what constitutes “cost” and “revenue,” and a discounting of the benefits athletics bring to their institutions, such as increased giving by alumni, a larger pool of student applicants, quality of campus life, and favorable budget treatment by legislators. And it stands to reason that few university presidents and boards of regents would retain athletics programs if they were indeed draining resources from their institutions’ core missions of research, teaching, and service. The UO counters this myth better than most—its athletics department receives no direct institutional support. In 2013, just 2.03 percent of the athletic department’s budget for all sports came from indirect support, such as student ticket purchases, the lowest among reporting institutions in the Pac-12. For comparison, institutional support provided 3.13 percent of UCLA’s budget (the next lowest in the conference) and 18.74 percent of Oregon State’s. About 350 of the UO’s 485 student-athletes receive some form of athletic scholarship annually, which may be applied toward tuition and fees, room and board, and required course-related books. However, the NCAA limits the number of scholarships each sport receives, so not every student-athlete gets a full scholarship. For example, the 19 softball players who represented the UO at the Women’s College World Series this year shared 12 scholarships, while just 12.6 scholarships were split among the 63 members of the 2014 NCAA indoor and outdoor championship-winning UO men’s track-and-field team. At the UO, only one in four student-athletes receives a full scholarship, and there are more walk-ons who are not on athletic scholarships than there are student-athletes receiving full scholarships. Persistent stereotypes about “brains versus brawn” can create unfortunate misperceptions about the academic aptitude of student-athletes, beginning with the admissions process. Of last fall’s entering class, only five student-athletes were “special admits”—those granted conditional admission based on exceptional talent or promise in a particular area. And once admitted, all students must meet the same requirements for graduation. Last year’s incoming group of student-athletes entered the UO with an average GPA of 3.31 (the average for the university overall was 3.60). We love our Ducks, and many of the UO’s top donors have shown their love with some truly generous gifts that have clearly helped raise the profile—and performance—of our sports teams. But donors love science, art, and scholarship, too. Of the university’s top 100 donors, 53 percent have supported academics only, 5 percent have supported athletics only, and 42 percent shared the love with both. According to meteorological records, it has sprinkled, misted, showered, drizzled, stormed, poured, or otherwise precipitated on about 35 percent of home game days over the past decade. 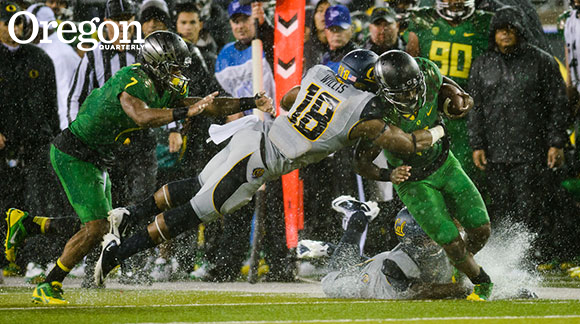 (Remember last year’s 55–16 sloshing of Cal?) But what’s a little wet stuff to a Duck, right?